The Ministry of Industry and Trade says electricity prices will go up 8.36 percent starting this month to cover rapidly rising costs. Vietnam slides to fourth among the most optimistic countries globally in the final quarter of 2018 from the second ranking in the previous three months, in terms of positive consumer index. At the Vietnam Agricultural Production and Consumption Promotion Forum 2019 in Ha Noi, Minister of Agriculture and Rural Development, Nguyen Xuan Cuong, stated that the consumption of farm products is expected to face difficulties this year, as there will be increased competition in the global market. The Asian Development Bank (ADB) and the World Bank (WB) have decided to use the Vietnam National E-Procurement System (VNEPS) to conduct online bidding for construction and goods supply contracts for their projects. The rapid growth of the digital economy in the past few years has speeded up the evolution of the retail industry and changed consumers’shopping behaviours, requiring retailers to innovate to better serve customers’ diverse needs and provide them with better shopping experiences. Việt Nam ranked fourth in the world in its Consumer Confidence Index (CCI) of 122 percentage points (pp) in the final quarter of last year, according to the Conference Board Global Consumer Confidence Survey conducted in collaboration with Nielsen, a global measurement company. Fifty-eight leading travel and resort companies from Vietnam are participating in the 2019 International Tourism Exchange Berlin (ITB), the world’s leading travel trade show, in Germany from March 6-10. Vietnam on Thursday (Mar 7) jailed 15 people for “causing public disorder” after violent demonstrations last year over a proposed investment project that protesters said catered to Chinese firms. 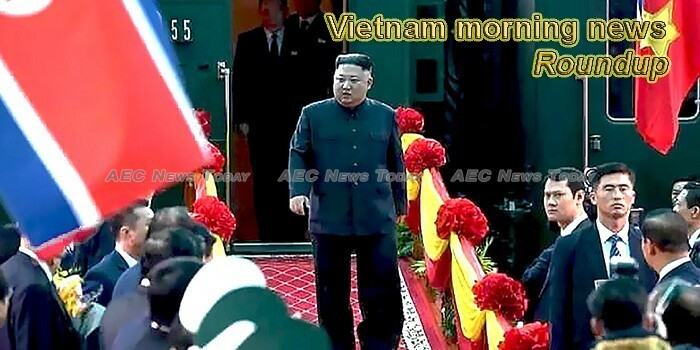 North Korea’s 78-minute film downplayed the DPRK-U.S. summit, stressed importance of ties with Hanoi. The Federation of Labour in the northern city of Hai Phong on March 6 launched a free wifi network for workers living in rented houses. Investors in Build-Operate-Transfer (BOT) contracts will be asked to stop collecting fees if they don’t apply electronic toll collection (ETC) by the end of the year. Domestic and foreign visitors will be treated to free coffee at the seventh Buon Ma Thuot coffee festival to be held from March 9-16 in the Central Highlands province of Dak Lak. The Vietnamese Government should outline policies to promote breakthrough technologies and bolster digital economic development amid the Fourth Industrial Revolution, World Bank Country Director for Viet Nam, Osmane Dione said yesterday. The Hanoi Paragon Hill Resort in Van Hoa commune, Hanoi’s outskirts district of Ba Vi, has been recognised for setting three records by the Vietnam Record Association. Industry insiders say chains are set to ride high on retail sector potential with annual growth of 20-30 percent. Women are taking a larger part in Việt Nam’s economy and backing women entrepreneurs will help the country boost growth. Prime Minister Nguy Xuân Phúc has approved a new plan that focuses on restructuring the securities market until 2025. Renovation, innovation and disruption are the drivers that will help retailers integrate into the tech world and the creative economy, speakers said on Thursday at a retail technology summit held in HCM City. The Green Climate Fund (GCF) will continue supporting the central province of Quang Nam’s climate change adaptation efforts this year by sponsoring the construction of flood-proof houses and the cultivation of mangrove forests. Construction and real estate group Sao Mai (ASM) on March 20 will finalise the list of beneficial shareholders that will receive bonus shares for 2017 and 2018’s performance. With increasing discussions about Vietnam’s “miracle growth,” a Vietnamese image of aggressive economic development has gone viral on social media in recent days. Although the VN-Index successfully surpassed the 1,000-point landmark on Thursday morning, it did not maintain the uptrend in the afternoon as the large selling force put pressure on many large-caps. Tata Coffee Vietnam Company Limited, a 100% subsidiary of Tata Coffee, unveiled their state-of-the art freeze-dried coffee production plant Vietnam, at a grand ceremony, on March 6. The National Assembly’s Justice Committee on March 6 asked relevant ministries to analyse shortcomings in road and railway transport. The 2019 Việt Nam International Furniture and Home Accessories Fair (VIFA-EXPO 2019) opened on Wednesday at the Saigon Exhibition and Convention Centre in HCM City, with the participation of 514 local and international exhibitors.